Picture Book Den: Looking into the eyes of picture book characters. 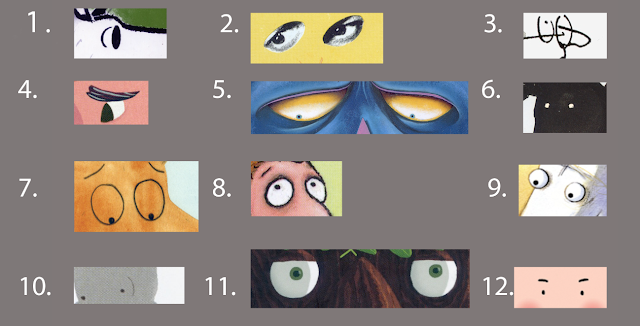 Looking into the eyes of picture book characters. Garry Parsons takes a closer look at how illustrators render the eyes of their characters. Julia Sarda from The Liszts written by Kyo Maclear. Recent conversations about characters' eyes have left me in a spin. It’s clear that some people have a preference for how characters' eyes are rendered - and why wouldn’t they? You may have a preference yourself. You may prefer just dots, or you might prefer ovals with dots. There are dots, then dots within circles, then circles with dashes, then ovals with dots, and ovals with dashes, then almonds with lids and lids with lashes and lashes with dots and a lot more variations too tricky to describe. But the closer I looked the more compelling it became. But it is not only individuals who have preferences. Apparently, book markets across the world have differing collective preferences on how eyes should be rendered, some favouring dots, others preferring dots within circles, for example, which may leave you with a conundrum if you aim to sell your books in more than one country. We all know that the co-edition market is important for book sales and book longevity. And what a joy it is to receive copies of your work translated into Chinese, Estonian or Swedish! But does the shape of the eyes have an impact on what sells abroad? Supposing we were to jot down a list of criteria for a picture book to generate enough interest to secure those vital sales abroad, how far down the list would the shape of the character’s eyes be? And if individual countries, or even continents, do have a preference, then couldn’t the sales team just tot up the figures and request that the illustrator give the character the eyes appropriate for the market they want to sell to? It seems that it’s not quite that simple to appeal to everyone, sell to the whole world and cover all the bases, but the conversations I was having seemed to imply that there might just be a happy medium to accommodate a healthy majority (if not everyone) somewhere in between a half circle and a dash perhaps, something that could satisfy almost every cultural requirement. Can you supply the holy grail of character eyes that appeals to pretty much everyone, please, Illustrator? So exactly what shaped eyes should you do? And does it really matter anyway? Surely the story and the overall feel of the book is way more important than such a small detail. After all, we are talking about something as simple as a dot or a dash. I’m back in a spin. Reaching for the bookshelves, I browse through the variety of eye shapes to look at techniques illustrators have employed at different times to convey the eyes of their characters. From the 1960s to the present day, the spectrum goes from the realistic to the wildly bizarre, but mostly, in essence, they are all variations on dots or dots within circles to some degree. There are now lots of picture books spread all over the desk and floor. Within this pile of books I noted that some illustrators alternate between dots and circles from one book to another, not sticking to one method throughout their career, but moving back and forth and chopping and changing technique. In one book a character has dots, in the next the eyes have circles, and then in another book by the same hand we are back to dots again. I even surprised myself, when I noticed how my own characters have switched and swapped between dots, circles and half circles over time, too. 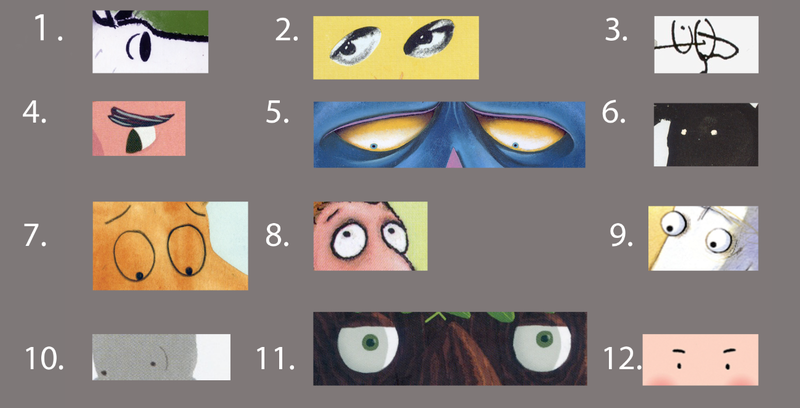 There are illustrators who use the same eye shape throughout a whole book for multiple characters, and some who vary this. In some books animal characters are adorned with the same eyes as the people they converse with, and in others they are not. Sometimes animals and make-believe characters are given distinctly different eyes to their human counterparts, and then in some, human characters have dots and their human companions have circles on the same page. Some characters appear to flick between the two (in the blink of an eye) with the eyes changing from dots to full round circles to express, shock, horror or delight and then returning to the mildness of dots again. I hoped I might identify fashions or trends for eye shapes within this pile of books in front of me, but there were always contradictions and alternatives. Obviously my quick study has been confined to just one collection of books. I’ve not explored the archives of the British Library or studied the bookshelves of other countries, but one thing that is clear is that these eyes are not just dots, circles and dashes, seen in isolation. They have to be viewed as a whole. The rendering of the eyes is embedded in the nature of the character and within the style of the illustrator. To separate the eyes out from the rest of the whole now seems like a ludicrous notion. Would we then have to have a similar conversation about noses? A tick or a curve, a blob or a point...? So, where to leave this ramble about eyes, be they dots or be they circles? Back in the place where picture books belong, I think. On a shelf where there are no rules and where the impossible can become possible through words and pictures combined. And where no one, it seems (even though we may try) can predict the ingredients of a worldwide bestseller. So, if you find yourself feeling conflicted over a detail like dots or circles, maybe it’s best to forget whom you are trying to please and just let your characters decide for themselves. We're going to end on a quiz! Can you identify who the illustrator is by the eyes alone? Answers will appear in the comments section on Tuesday evening. So there's no peeking! Garry Parsons is a children's book illustrator. See more of Garry's illustration here. Interestingly, the illustrator of my book The Peddler's Bed, Bong Redila, chose to render the eyes as circles with no dots whatsoever--an unusual choice, to be sure. But it works! Thanks for the thought provoking post, Garry. Yes, "let the characters decide for themselves"! Love that! Hmmm, I'm struggling with the eyes quiz! It's hard! I'm only actually sure of 1! I'll have to come back on here to check the answers. OK. So the quiz is quite hard, I agree. But have a go if you've not attempted it already. 7. Marta Altes - from No! So how many did you get right? Ha ha, I only got two right (probably luck! ), but really enjoyed your blog post, Garry. Thanks. It's such an interesting subject - there can never be enough blog posts on eyes! Thank you for the link Peony, I've just read this. A fascinating subject and always good to read insights from other illustrators. Ony three, but I'm kicking myself over a couple of the others! Completely fascinating about eyes! I got 5 but including Dog from 3 by Sea! Amazed at the ones I didn't get! It's a really interesting theme. Number 8 is Axel Scheffler. Sorry for the typo earlier Axel.